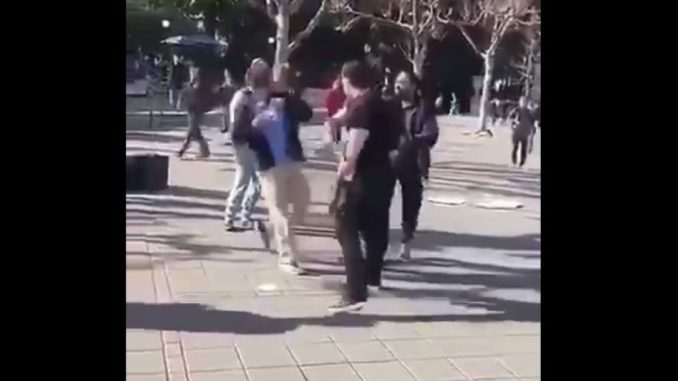 On Wednesday, the Daily Californian reported that a man tabling for the conservative group Turning Point USA (TPUSA) was allegedly assaulted on Tuesday by an individual characterized by TPUSA founder and president Charlie Kirk as a “leftist thug” at the UC Berkeley campus. The victim alleged that he had been tabling for the conservative group Turning Point USA on Tuesday afternoon about 3:29 p.m. when two males approached the table. The victim alleged that a verbal altercation ensued, and he began filming the interaction with his phone, according to the alert. One of the two men slapped the phone out of the victim’s hand and proceeded to knock over the table, the victim further alleged. While he and the suspect struggled for the phone, the suspect punched the victim several times, causing injury to the victim’s eye and nose, the alert said. “Imagine if the attacker was wearing MAGA hat, would be national news,” Kirk said on Twitter in a message that included a video of the attack. Why has this Leftist thug not been identified and arrested for assault? Someone knows this guy. Good question. Liberal privilege, perhaps? According to the Californian, the suspect left the scene before authorities arrived. The report further says that anyone with information regarding the incident is asked to call (510) 642-6760. Sad the amount of students standing around doing nothing and a girl laughing on the audio after he gets hit. It actually says a lot about the left in general and insane lunatic leftists at Berkeley in particular. What’s ironic is that Berkeley is the birthplace of the so-called “free speech movement.” But as we’ve seen time and again, the only speech that is apparently tolerated on campus comes from the left. Of course, this makes us wonder: Do lunatic leftists at Berkeley want a second bloody civil war over Donald Trump? What do you think? Let us know in the comment section below and take our poll, here.